Friday’s Child is Loving and Giving…. 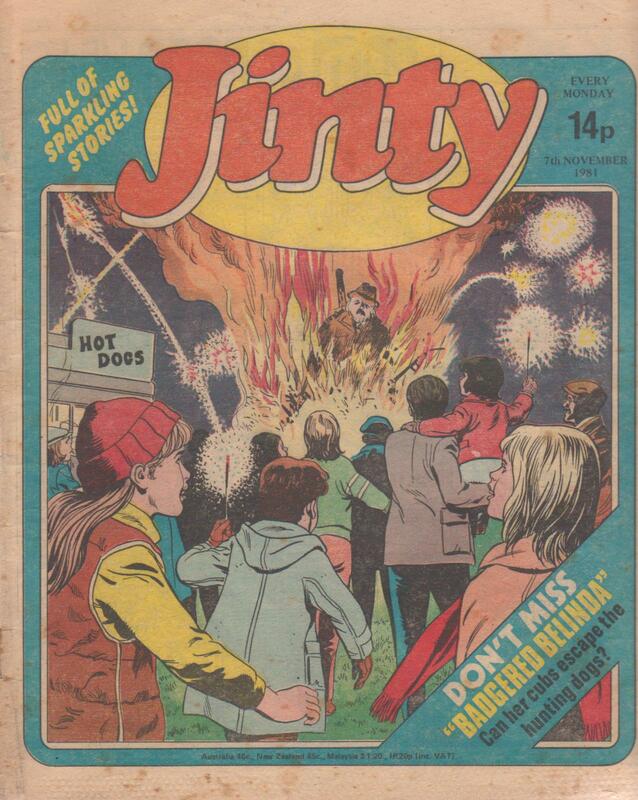 This was Jinty’s last Guy Fawkes issue, and there were only two more issues before the merger. Jinty‘s drop in energy seems to be falling even more with this issue, because the Guy Fawkes celebrations are even more lacklustre than those for Halloween in the previous issue. Only the cover features Guy Fawkes. The text story inside is on a completely different topic – a treasure trove – and the spot artist is not even Mario Capaldi. All the regulars are on business as usual and none of them are even thinking of fireworks and bonfire parties. The back cover is a surprise, though. Alley Cat, who had not been seen in Jinty for several years, suddenly makes an appearance. There is no sign of Snoopa, and Snoopa artist Joe Collins draws a spot feature of some jokes in this issue. Was Collins not available this issue and the editor had to find fill-ins for the gag spots?